Huckleberry Finn is the main character in Mark Twain’s The Adventure of Huckleberry Finn. He is a thirteen year old boy, dressed nicely when he is forced to, and dressed in whatever he can scrounge together when not. He is motherless and son to a drunk, and ran free for some time, doing what he pleased. However, he is taken in by a widow to be “sivilized”. He receives the beginnings of a formal education under the widow’s care, although he does not completely warm up to the idea of living a structured life like hers. In his words, “at first I hated the school, but by and by I got so I could stand it” (Twain 14). Huck is not the type of child to live the same way every day. He seeks adventure and new experiences all the time, motivated by his curious nature, which often lands him in sticky situations. However, he is clever and resourceful, able to get himself out of situations as easily as he got into them. As troublesome as he can sometimes be, he is really a good and moral child. 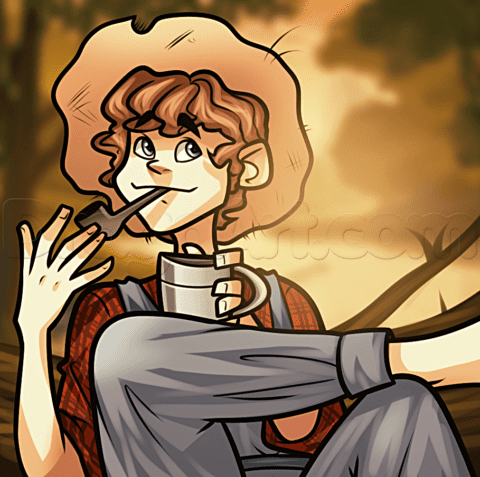 His thinking is influenced by society, but as The Adventures of Huckleberry Finn progresses, Huck begins to act on what he really thinks as opposed to what society says he should do. I admire this about Huck; he has a good moral compass. Huck is an integral part of the story. He has an impact on all those around him, from Jim to all the people they meet along the way, like the Wilks family and Aunt Sally. To most, he has a positive impact. He is a companion to Jim, and Jim considers him a close friend, a best friend in fact: “Jim won’t ever forgit you, Huck; you’s de bes’ fren’ Jim’s ever had; en you’s de only fren’ ole Jim’s got now.” (page 83). Huck helps people, such as the Wilks, by warning them of lies. He brings laughter and happiness to people such as Aunt Sally, even if he is a bit mischievous at times. Huck is a good child and a great protagonist, showing readers the extend of possibility for character development. Huck Finn Discussion Topics by Minnie is licensed under a Creative Commons Attribution-ShareAlike 4.0 International License. Hey Minnie. I thought it was really nice that we wrote about the same topic, so we could see the points that we agreed about. Your essay contained many points that were also included in my response. Your essay hit the point about his personality of being clever and seeking adventures. I think that Huck’s adventures are different from Tom, who serves as a foil. In your opinion, how does Tom’s type of adventure differ from Huck’s? Does Tom serve as a perfect foil to Huck? If Twain was to read your post today, do you think that he would agree to your diction? If I was Twain, I would have loved your diction in describing Huck; they were so precise like “troublesome,” “clever,” “moral,” “resourceful,” and the phrase “has a good moral compass.” It seems as though your essay was spot on with word choice whether it was describing Huck or using warrants. I agree with you about Huck being a positive impact to people around him. In the beginning of the book, I felt like he wasn’t that good of an influence, like doing the hat trick with Tom on Jim. How about you? But later on, he does make a positive impact as he matures, like trying to save Jim from slavery, and your perfect example of helping the Wilks. I really enjoyed reading your paper, Minnie! Keep up the good work! Huck is most definitely a good person with the right type of morals. There’s growth in his character as the story moves on and he undergoes many incidences and events that help add depth to Huck. Although, if you think Huck has changed throughout the story, why would Mark Twain say that there is no plot or moral to the book? If there’s obvious progression in Huck’s character with helping a slave become free in racist communities, there would have to be good intentions to the character who decides they would go to hell for helping someone of a different race. Even Tom Sawyer argues that Jim should be free to walk the earth, and this is coming from a boy who would only follow the rules and be more likely to conform to society. The characters who make this a moralistic story are the kids because they have a innocent and different mindset that allows for growth and improvement to be made.